About History For Sale and Gallery of History, Inc.
History for Salesm is a division of The Gallery of History, Inc.sm, the largest dealer in the world with an available inventory that exceeds 200,000 autographs and manuscripts acquired over a 47-year period. The company was founded by Todd M. Axelrod in 1981. Mr. Axelrod was also the author of three books on the subject of autograph collecting (click here to view his latest work). The Gallery of History is a founding member of the UACC and a long-standing member of the Manuscript Society. Each hand-signed document has been authenticated and is accompanied by a certificate of authenticity issued by our parent company Gallery of History Inc. The term of the COA is 10 years from the date of purchase and is valid to the original purchaser only. We have an outstanding reputation for the thoroughness of our research, for our business integrity and for our service to our clients. We financially stand behind our COA which is one of the main reasons we've been able to stay in business for so long (since 1981)! Condition: A key factor. A document in better condition will be more valuable than a comparable one in poor condition. Documents done en masse and signed by the same person are subject to price differentiation when condition is concerned. As an example, two military appointments or land grants signed by a particular president may have different value based on their condition. Rarity: Rarity means that there are not a lot of documents from a particular personality or when desired content from that personality is very scarce. The National Archives was established in 1932 and its doors were opened in 1935. Since our country was founded in 1776 there were a lot of intervening years where docuemnts resided in private hands. Prior to the creation of the National Archives, the Library of Congress acted as a repository for historical documents however it was established in 1800. This means that for 24 years between 1776 and 1800 some very significant pieces of history were in private hands. The bottom line is that our government was late in realizing the need for preserving and procuring our nation's history. Much of this has to do with the fact that as a democracy the organization of our country often works on a decentralized level. By virtue of working on a decentralized basis, preserving and curating U.S. history was not filtered through to the top as a national priority. The preconception of most Americans that our documents are locked up comes from the European historical experience which is much longer-lived than American history. Europe was organized by monarchies. These Monarchies maintained centralization of power and information and, therefore, it follows that Europe's significant documents were maintained by the governments. Organic acids and ultraviolet rays of light destroy paper and make ink fade over time. Each purchase from our company comes to you appropriately protected. Our unframed items are sent to you in either archival acid-free Mylar® sleeves or in Biaxially Oriented Polypropylene clear envelopes (which are archival and acid-free) or are encapsulated in acid-free Mylar. Our Gallery of History styled framed items are encapsulated in Mylar to guard against organic acids, mounted in an acid-free environment and are framed behind UF3-AR Plexiglas which blocks approximately 94% of the ultraviolet light. The Handbook of Historical Documents, A Guide to Owning History by Todd M. Axelrod (click here to learn more). 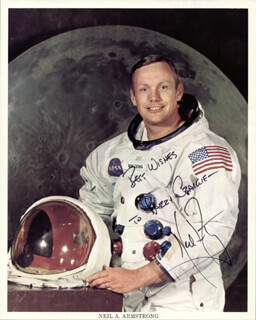 http://www.uacc.org: A non-profit organization dedicated to the education of the autograph collector. http://www.manuscript.org: An international organization of persons and institutions devoted to the collection, preservation, use and enjoyment of autographs and manuscripts. The the descriptions of the historical documents being offered on this site will often include its "document type". These document types are generally accepted terms used in the historical document collecting field. ALS - Autograph Letter Signed: A letter written in the hand of the person who has signed it. DS - Document Signed: A document which is printed and originally signed (it may be clarified by being either partially printed or engraved). ANS - Autograph Note Signed: A note written in the hand of the person who has signed it. AQS - Autograph Quotation Signed: Words or a passage which has been written in the hand of the person who has signed it. Manuscript LS - A letter written in the hand of a person other than the signer. ADS - Autograph Document Signed: A document written in the hand of the signer. Manuscript DS - A document written in the hand of a person other than the signer. Framed in Gallery of History style - The document is artistically presented and scientifically protected. The document is encapsulated in acid-free Mylar. It hangs behind a UF3-AR Plexiglas which shields up to approximately 94% of the harmful ultraviolet light and is abrasive resistant when cleaned. Historical background is often shown on an engraved metal plate(s) and a portrait photograph(s) is also included. 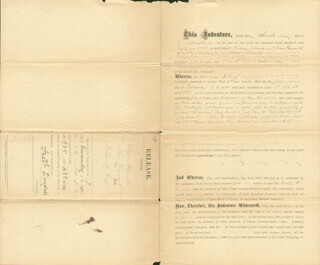 Two-sided documents are usually framed so that both sides can be seen.